August 1st marks the beginning of the end. With exactly one month until my New York City year begins, 9 years of traveling, moving, working, writing and living are coming to their payoff. I intentionally left NYC for the end of my project because I feared (rightly) that as a boy who had mythologized the Big Apple for so long, once I got there I would never leave. Now that I’m wrapping things up, I’m looking forward to the possibility of holding a job for longer than a year, renting an apartment through a second lease, hanging out with friends during more than one cycle of the seasons. And then again, I’m already peering two or three years down the line to where I may move once the bug hits again. I’m thinking a new continent is in order. For 9 years, everything (everything) has built towards this moment and with it so close, it’s difficult to express what that means. People ask me if I’m excited. I think I must be, though it’s hard to tell among the cocktail of emotions, concerns and thoughts that churn non-stop in my burnt out mind. At some point, the reality will set in. After I’ve found a place in Brooklyn. After I’ve begun working. After I’ve bought my first stock of groceries and eaten my first meal at a neighborhood restaurant. Then, it will become real. For better and for worse. Because once I’m in New York, that’s the end. The very thing that has defined me for nearly a decade will have run its course. I will be still. I know what my final 10 Cities tattoo will be, the one I will get in August of next year to mark the true end to the project. I’ve known for a couple years now, in fact. No, I’m not telling you what it is, but it will mark my transition into my new life. Or is it my old life? It’s worth noting that I began this site exactly 5 years ago. 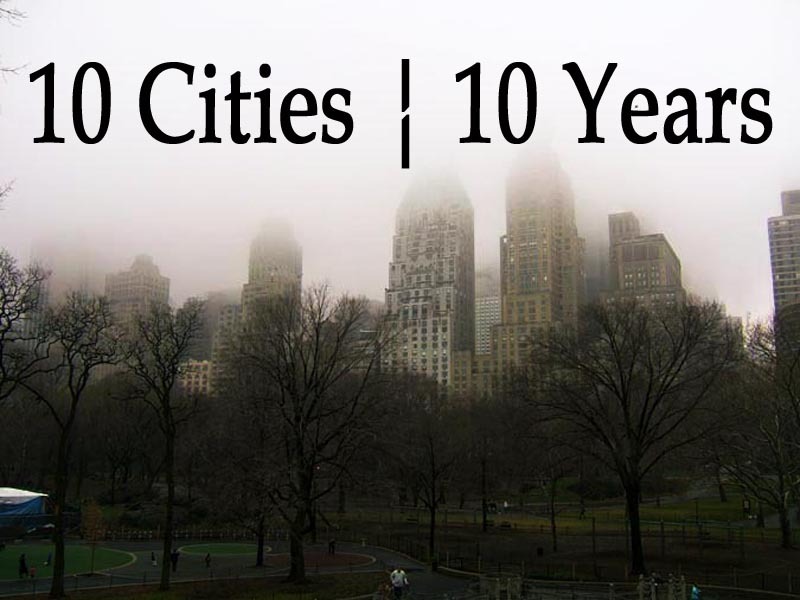 The creation of 10cities10years.com (still a WordPress address back then) in my last month in San Francisco marked the point when this project went from being a semi-serious joke to a fully realized idea, a life’s pursuit with all the unintended consequences that come of ambition. It’s not been easy. I’ve gotten old doing this. Anyway, I’m going to the beach today. And next week I’m flying out to Seattle to see old friends and revisit one of my favorite places in the whole country. Hopefully by the time I return from my trip I’ll be able to say I have an apartment in Brooklyn. And once I’m back, there will be just over two weeks left in Boston. A little more working, a little more drinking (who am I kidding? a lot more drinking), a little more exploring. I know you say there was never necessarily a goal or something that you wanted to come out of it, but I really love that you just took a moment to say, “I did this.” You did it! you left a mark on each place you visited. Each friend you made. Each odd job you took. Each apartment you rented. Each sidewalk you got lost on that eventually led you back “home”. And now you get to go to a place that seems to really feel like home to you. New york is my first move, so it seems that where your journey has led you (so far) is where mine was intended to begin. I’m truly happy for you.